The seal will be broken on the fifth edition of fall racing at Del Mar come Friday afternoon. 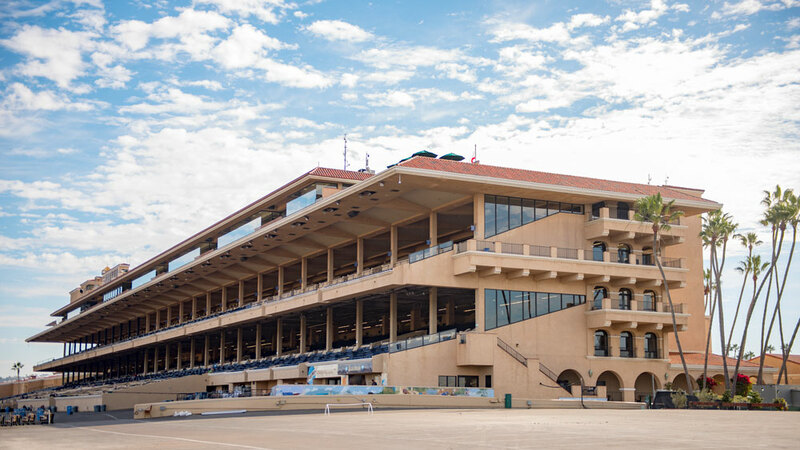 It is another chapter in a saga centered on the Southern California thoroughbred industry’s resolve to carry on after the demise of Hollywood Park through new days at a favored venue for horsemen and fans alike. And if the fifth chapter reads as well as the first four, that will be fine with the folks in the Del Mar racing office. “What we have done in the past with this fall meet has set the bar high,” racing secretary David Jerkens said. “We’re coming off a strong summer meet and hopefully that momentum will carry over. We’ll take it day to day and put out the best cards we can day by day and I think we’ll finish strong with the turf stakes at the end of the meeting. The first three fall sessions here were either 15 (twice) or 20 racing days in length. The 2017 event, 16 days in duration, was unique in that the opening weekend included Del Mar’s first hosting of the Breeders’ Cup World Championships (it’ll be back in 2021) and the track’s own complement of stakes races had to be sandwiched in from weeks 2-4. So the closing weekend slate had three graded stakes on Saturday and three more on Sunday of the closing weekend. This year, the same six stakes will be presented over a five-day period with two each on November 24 and 25 and one apiece on the closing weekend, December 1 and 2. The average field size for the past two years has been 8.5, a worthy goal for 2018. There were 67 entered on the opening day program, an average of 8.3. Gary Barber’s Way to Varsailles was made the 7-2 morning line favorite in a field of 12 for the featured $75,000 Kathryn Crosby Stakes on Friday’s program to open fall racing at Del Mar. Way to Versailles, a 4-year-old Florida-bred daughter of Tizway, was third in the Swingtime Stakes at Santa Anita on October 7 in her first start for trainer Peter Miller after shipping in from Canada. Way to Versailles was beaten three-quarters of a length by Fahan Mura in the Swingtime and was only a head behind runner-up Quebec, who is the 9-2 second choice on oddsmaker Russ Hudak’s line for the Kathryn Crosby. The race for older fillies and mares is contested at a mile over the Jimmy Durante Turf Course. The field from the rail: Gliding By (Evin Roman, 8-1), Pyscho Sister (Edwin Maldonado (20-1), Miss Southern Miss (Assael Espinoza, 20-1), Excellent Sunset (Mario Gutierrez, 8-1), Shehastheritestuff (Geovanni Franco, 20-1), Quebec (Rafael Bejarano, 9-2), Way to Versailles (Flavien Prat, 7-2), Tonahutu (Gary Stevens, 6-1), Escape Clause (Ruben Fuentes, 20-1), Sweet Charity (Mike Smith, 6-1), Last Promise Kept (Drayden Van Dyke, 5-1), Pantsonfire (Kent Desormeaux, 12-1). Also eligible: Birdie Gold (Mike Smith, 10-1). Prince Earl, a 3-year-old gelded son of Paddy O’Prado out of the Unusual Heat mare Soo Steamy, will put his undefeated (2-for-2) record on the line in Saturday’s featured $75,000 Let It Ride Stakes for 3-year-olds at a mile on the Jimmy Durante Turf Course. Trained by Phil D’Amato, Prince Earl will have 2018 summer meeting riding champion Drayden Van Dyke in the saddle for the first time. Martin Garcia was aboard when Prince Earl won at first asking by 3 ½ lengths on May 20 at Santa Anita and again in a half-length score at the allowance claming level as the 5-2 favorite here on September 1. The post position draw for the Let It Ride was later Wednesday afternoon. The field in alphabetical order: Afleet Ascent (Kent Desormeaux), Calexman (Geovanni Franco), Choo Choo (Flavien Prat), Extraordinary Jerry (Mike Smith), Fight On (Rafael Bejarano), Prince Earl (Drayden Van Dyke) and Risky Proposition (Joe Talamo). Trainer Doug O’Neill’s stable took up residence as usual in Barn Y nearest the end of the grandstand on Monday. O’Neill’s top assistant, Leandro Mora, will be in charge of the daily operation here while O’Neill handles things at the L.A. area headquarters and commutes on race days. O’Neill’s stable comes in off a second-place finish to Peter Miller in the 2018 summer meeting in which it amassed purse earnings of $1,347,952 and made major client J. Paul Reddam the third-leading owner for wins with 10 and second for money earnings with $750,665. Team O’Neill didn’t make a MMMTop 10 impact on the inaugural fall Del Mar session in 2014, but won the 2015 training title (15-for-69, $484,760 in earnings), was second in 2016 (8 for 52 , $445,245) and tied for third last year (8 for 57, $406,204). O’Neill has 20 horses stabled here at present and he’ll be shuttling runners in and out through the course of the 16-day meeting. The stable is looking forward with anticipation to starting 2-year-old filly Lakerball in the Grade III $100,000 Jimmy Durante Stakes on Saturday, November 24. “She’s our rising little star,” Mora said. The California-bred daughter of Lakerville broke her maiden here in her second career start on August 8 and won ungraded stakes at Santa Anita and Golden Gate Fields in October. She is owned by a partnership that includes Janie Buss of the L.A. Lakers-owning Buss family. Takeo Squared, a 2-year-old gelded son of Square Eddie, is targeted for the Cecil B. DeMille Stakes on November 25. Takeo Squared broke his maiden here on August 16 and was third while encountering trouble in the Del Mar Juvenile Turf on September 2. CLOSERS -- A new face in the Del Mar jockey colony is Keiber Coa, son of Eibar Coa, who won more than 4,000 races in his career. Equibase statistics show Keiber with 34 wins from 340 mounts and more than $780,000 in purse earnings for 2018, on pace for the second-best year in a career started in 2012. He will be represented by agent Joe Griffin.